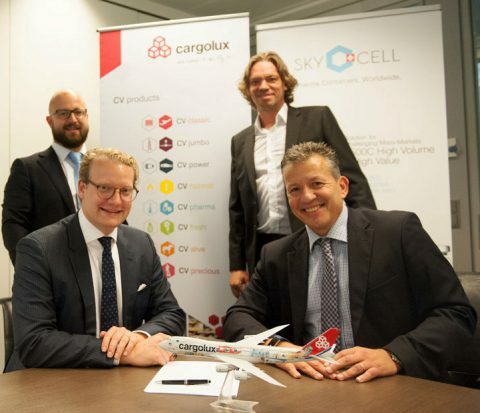 Cargolux and SkyCell have teamed up in a global container rental partnership to offer Cargolux’s pharma customers an enhanced service with SkyCell’s temperature-controlled containers. SkyCell is a Swiss-based, award-winning provider of temperature-controlled container solutions with a special focus on emerging markets and sustainability and with one overriding goal: producing the safest container on the market. With its new containers, Cargolux can safely transport pharma products in the +2°C to +8°C and +15°C to +25°C range in outside temperatures between -35°C and +65°C, even over multiple days. The containers are a boost to Cargolux’s cool chain transport services that also offers personal attention, detailed tracking and temperature monitoring for its customers. Cargolux is the world’s first GDP-certified airline, as well as the world’s first ‘Lean & Green’ carrier and operates from one of Europe’s most modern pharma and healthcare shipment centres, operated by its partner LuxairCargo at Luxembourg’s Findel Airport. Its expert staff is highly trained and motivated with a thorough knowledge and experience in their field. Its fleet of modern 747 freighters ensures the safe, fast and efficient transport of high-value, temperature-sensitive shipments across a global network. Adding SkyCell’s patented containers to its portfolio gives Cargolux an additional effective tool that benefits its customers’ specialized requirements.